How to act when school is threatened by violence? School shootings are extremely rare in Sweden. However, the social climate is becoming tougher and violent incidents do happen. Consequences can be very difficult to handle, therefore it is important to improve security alarms and routines for emergency situations. Evacuation is most common when there is a fire or risk of explosion. It is often the safest option for those who are in stairways or at the schoolyard, and if you can ensure the offender will not detect persons who are fleeing. Invacuation is the opposite of evacuation. This means students and staff are safer inside the building, hiding in classrooms - lock the doors, turn the lights off, stay silent and stay away from windows and doors. Lockdown - If there is an intruder in the schoolyard, it may be necessary to lockdown the school building. The entrances to the building and/or site are locked to prevent the intruder from entering. There are alarm systems with different types of signals, loudspeaking announcements or secret codes. You can make announcements with different content to different zones, some people might have to run, while others should stay where they are. Thanks to smart intercom solutions it is possible to listen in the situation of a threatened zone, and there are intercom units also available with built-in camera, to catch the intruder on tape. Each situation is unique and impossible to predict. But in an emergency situation, the action plan is crusial. 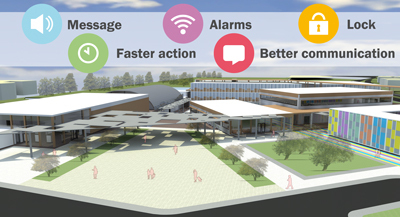 To create the best system possible, we offer solutions customized after the individual school premises and conditions.